My name is Edward Chastain and I am a master donut maker with 2+ decades experience in the doughnut business. I have personally tested dozens of Internet donut recipes for ingredient consistency in my donut shop (out of pure curiosity). Friends, not all donut recipes are created equal! Most Internet donut recipes are theory based, untested recipes producing poor end-products that taste like bread and result in a complete waste of time in the kitchen— unlike my expert donut recipes that are used everyday in my donut business. I will give you trade secrets passed down to me from old time bakers of yesteryear; such as donut recipe calculations and formulas never before shared. 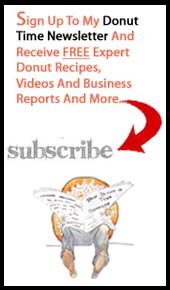 You will receive donut recipes such as my 3 milk buttermilk cake donut recipe, pumpkin cake donut recipe, and an apple cider cake donut recipe that is simply delicious and a great winter treat. In addition to donut recipes, I even share a number of donut formulas with donut calculations and donut business information. After all, I’m an expert donut maker and I'm hopeful that I can instill my passion for donut making upon you in its entirety. Keep reading: Below is your first Expert Donut Recipe Lesson and then go capture the donut recipes. The traditionalist bakers and donut makers of yesteryear (the ones from whom I learned) would not appreciate me giving away trade secrets. That's the way it is with bakers--they made everything from scratch and guarded the recipes well! This is going to make a lot of people reappraise those donut recipes they acquired from the Net. While a net recipe can often be an effective introductory tool, some things can only be learned from a experienced donut maker. Here's the first donut recipe lesson. Would a gourmet chef prepare a chicken soup with no chicken stock? Of course not. So, what's the number one reason most donut recipes produce lousy yeast donuts? They don't add "stock." And what would stock be for raised donuts? Brew. Brew is heavily yeasted dough that has reached peak fermentation activity and then is refrigerated for 24 hours before baked. Brew dramatically improves flavor for all raised donuts. (Why are they called "raised donuts"? Yeast!) Brew will dramatically improve flavor, reduce preparation times, and consistently lead to quality yeast raised donuts. Use a container (a five-gallon bucket works great) and place in it the previous day's brew. You can also place the brew on a rolling table and cover it in plastic wrap. About an hour later, the exposure to room temperature air will have activated the yeast in the dough. Cut the brew into 4-by-4 inch cubes and incorporate into your general yeast donut dough. So there you have it! The next time you make yeast donuts be creative and always look at the finished product and wonder if you could have done it any better or sweeter. Have fun in the shop, and enjoy listening to your customers. They will always appreciate your hard work by buying your donuts. Not All Doughnut Recipes Are Created Equal! NEW Videos- Kids taste testing my doughnuts!